This is NOT an ad for a car parts company. I'm new to this, so I'm excited about something that some of you already know and have done. I bought a 2006 Taurus SEL for $400 with a clean title. I planned on spending another $1600 or so to get it just right. The body is great, sunroof, no rust, great paint, low miles. It needs a tune up and some parts replaced. It needs Power steering pump, Battery, hood lifts, air filter, a hood jouncer(? ), three tires and a few non-critical trim pieces. Oh, and an ENTIRE interior. The leather interior was absolutely shredded, even the foam under the leather. Plus it stank of funk. My guess is that someone or something died in it, or it was a flood car or it has a very leaky passenger side issue. Or all of the above. I removed the entire interior. Literally everything that was made of cloth except the headliner. It's an empty metal shell inside now. 1) Repairing the interior is outrageously expensive. 2) Buying the individual pieces is very expensive. 3) It's too difficult to find every piece matching. I watched Craig's List and found (and bought) a state inspected 2002 Taurus for $400. Clean title. 200,000+ miles. The body is beater-chic but the interior is pretty good. It runs great but doesn't shift into OD. It has nearly new: battery, plug wires, plugs, hood lifts, alternator plus most of the missing pieces I need except for the center console flip-thing. It also has two almost new tires and one good enough to pass inspection. Basically, I just bought about $2000 worth of parts for $400. Now, hopefully, all I have to do is transfer the parts to the 2006 Taurus, repair the rest and have someone tow the 2002 donor car to a junk yard. Congrats...very fortuitous to be able to buy a parts car at that price and save yourself time and money chasing down parts. Hopefully, you can get rid of that smell and it doesn't come back when it really gets hot/humid outside this Summer. I have the luxury of a U Pull yard about 15 mins from the house and I find all kinds of nice used parts for a fraction of what new would cost. Makes sense to me as, with 256K miles on my car, I don't know if it will last another day...or, another year. Recently, was tempted to redo my interior from gray leather to black when a '05 Sable with super nice interior showed up. Would have cost me less than $200 including complete dash...but, decided it was probably pointless due to aforementioned reason of high miles. Besides, replacing the dash was way more work than I wanted to deal with. Good luck with your new ride! BTDT with my old Durango. It had some rust, mismatched body colors, etc. Bought a little newer one(same generation) but an R/T in the same color with a blown motor and no title for $200. Swapped over about $1500 in parts and scrapped the shell for $150. If one has the time and will there are good savings out there. I am getting a bit old for this (79) but still visit the local Pick A Part. About 2 miles for me now. Many trips out there, hood and top glass when a tree fell on my '03. 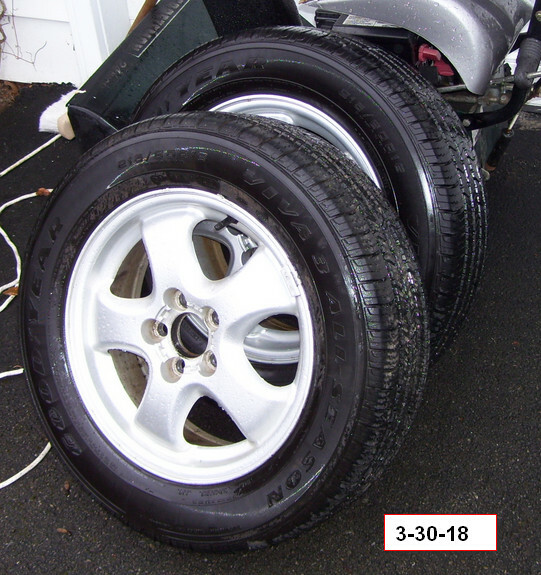 Recent found they sell alloy tires/wheels for $30 including tax. I found these on the office rack so no effort except I went out and got the lugs as I am replacing 7 spoke. So I began to watch each week their new intake and drop by and check for condition. So over couple months got total of 8 and switched out both my '03 Sables. Now it will cost me $2 per get rid of the old ones. Saved a relative in a pickle. V6 Chrysler product and he was changing the fuel injectors and broke a plastic fuel rail. Son was visiting and we went out and took us 15 minutes total in and out and $15. Dealer wanted ~$400 and 4-6 week delivery. This family only vehicle. Last edited by chartmaker; 03-05-2019 at 06:39 PM. How many hours in total do you think you'll spend on this? Include getting the donor, doing the work and getting rid of the donor. Hey RJacket, Good question! In this case, my son is helping and we get to spend some time together so I haven't been counting or anything but it took us maybe 4 hours to remove the interior. It would have been shorter but neither of us did it before and the carpet and foam was tougher to pull than we thought it would be. We had to cut it up to get it out. It goes pretty far up under the dashboard and some of it we can't get to and I'm not so sure about pulling the dashboard. The drivers seatbelt was removed because it was covered in black/brown filth. We were able to clean up the ceiling and save that. We've been doing a little at a time since them because it's been too cold out. I give ya lots of credit for restoring an old Taurus but not sure I'd mess with a smelly vehicle that someone may have died in. It might be haunted!! Back in my younger years I restored my 88 GT Mustang after an engine fire. After the insurance company totaled it out, they sold it back to me for $500.00. Gave another $500.00 to a you-pick junkyard and replaced the wiring harness and everything else that melted. So for a thousand bucks I had my 50,000 mile Stang back on the street with a salvage title. Ended up selling it a few years later for $6,000.00. I would not waste time or money on that. 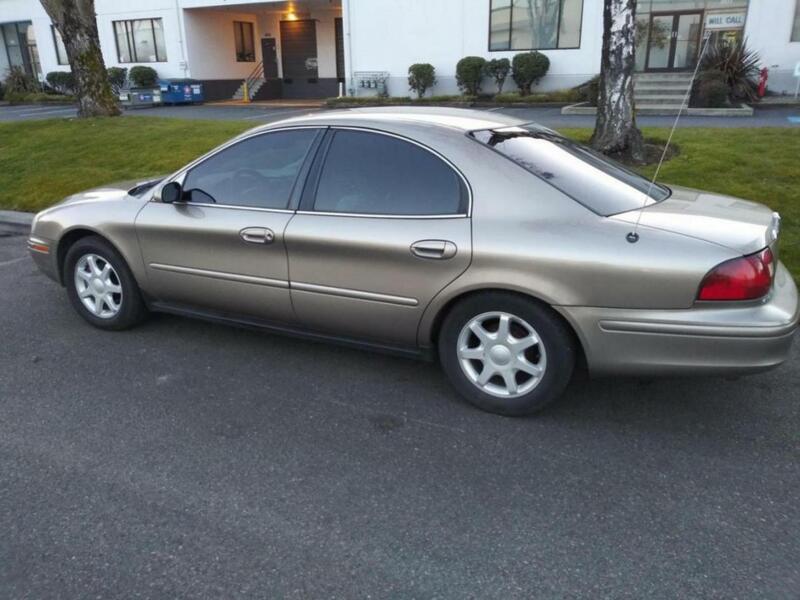 I got just about perfect sables and tauruses for way cheaper than that i found on Craigslist from private owner's, For example in the picture i got this 03 sable ,116K miles, just about mint condition for $1200 last summer. Last edited by Bannerj29; 03-13-2019 at 09:14 PM.